My family has been closely affected by allergies and asthma and I know firsthand how these disorders can affect sleep, concentration levels, and day to day activities. Uncontrolled allergy and asthma can fundamentally diminish one’s quality of life. Appropriate therapy can be life changing. Many people do not realize how much control they have over these symptoms. My role is to carefully listen and to provide you with a precise diagnosis and a tailored treatment plan. I want you to be armed with the best tools so you can take control over your health and enjoy your life symptom-free. 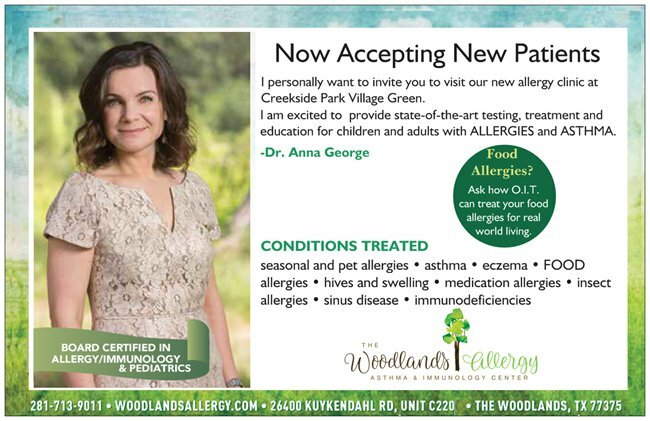 Dr. Anna George is Board Certified in Pediatrics, Allergy, and Immunology. She finished her fellowship in Allergy/Immunology at the Children’s Hospital of Michigan in 2009. Before moving to The Woodlands in 2015, she practiced allergy and immunology in Colorado for 5 years. In Texas, Dr. George joined forces with Dr. Stephen Miles. By August 2017 their clinic was rated as the Best Of The Woodlands by the readers of Living Magazine. That same year she realized her dream of opening a new location in Creekside. Dr. George strongly values communication and patient education. She uses her knowledge, experience and cutting-edge breakthroughs in the world of allergy and immunology to search for answers and empower her patients. She enjoys reading, traveling and culinary adventures. She is a pescetarian and always looking for a quick but delicious seafood recipe. Her free time is often spent outdoors with her husband and their young daughter.